Dr. John Vartanian, a top facial plastic surgeon in Glendale, offers a comprehensive array of treatment options to improve the appearance of scars. Skin scars can be caused by previous trauma, surgery, acne conditions, and other skin injuries. There are many different types of scars, and the type you have will dictate the treatment method that can offer the best results. Scars can be raised (hypertrophic) or depressed. Depressed scars can further be divided based on the shape of the depression. Defining the type of scar can help determine the best treatment method. Depressed scars are quite common scars resulting from acne, skin trauma, accidents, and previous surgery. Depressed scars can be improved by removing the scar surgically – usually in the office. Skin fillers can also be used to improve most depressed scars in an easy, immediate, and quick way. 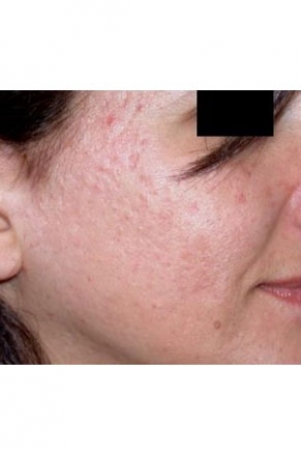 Advanced lasers or dermabrasion can also be used to treat skin areas with depressed scars, such as in acne scarring cases. Hypertrophic and keloid scars are thick, raised scars that can sometimes be treated quite successfully depending on their location and history. Skin type and individual healing characteristics will affect scar revision results. The goal of scar revision is to transform an unsightly or obvious scar into a well-camouflaged area that is not noticeable or less noticeable than before. Contact our practice today for more information on scar revision, or to schedule a consultation. Depressed scars (like acne scars or an old cut) can often be treated with dermal skin fillers like Restylane®. These injectable treatments can be performed to add volume below the skin in the area of the scar, helping the skin to attain a more even and smooth appearance. Acne scar repair with dermal fillers has proven very effective, and the results are often longer-lasting. Once the effects of the dermal filler begins to fade, follow-up treatment can maintain the results. Dr. Vartanian combines a subcision technique with his dermal filler injections whereby he “releases” the scar prior to filling it. This combination often yields long-lasting results and can stimulate collagen formation and scar remodeling for a more permanent result. Some scar types may require removal of the scar for the best result. Some scarred skin will never look normal and as such, just needs to be removed. The empty space left by removing the scar is then closed by moving the nearby normal skin together. Almost all surgical scar revisions are done in the office with local numbing medicine. When the scar to be removed is larger or in an aesthetically sensitive area, Dr. Vartanian can use a number of advanced plastic surgical techniques to improve the scar. These include: Z-plasty, W-plasty, O-T closures, Rhombic flaps, and other types of skin flaps. In addition, Dr. Vartanian uses the finest plastic surgery sutures and skin glues to further help achieve the best results. In some cases after surgical excision or revision, Dr. Vartanian may recommend a followed up treatment with dermabrasion or lasers. A hypertrophic (thickened) scar is a skin scar characterized by deposits of excessive amounts of collagen which gives rise to a thick raised scar. Keloids are a more aggressive version of hypertrophic scars that are bigger and spread wider than the original cut or skin injury. These thicker scars are formed in some patients in response to injury and are more exaggerated than normal scars. Keloids and hypertrophic scars tend to occur more frequently in certain body areas (chest, shoulders, earlobes) and less in the central part of the face. Scars may be stimulated to become thicker due to the initial skin injury getting infected, containing a foreign body (like dirt), or getting continuously traumatized (like rubbing or picking at a scar). The treatment of these thick keloid scars can be tricky as they may recur and come back more aggressively after laser or surgical treatment. In many cases, Dr. Vartanian can treat these scars with a combination of careful surgical removal followed up with regular post-surgical injections of medication that can slow down scar formation. These injections of triamcinolone (Kenalog) can also be used initially in an attempt to shrink the thickened scars without surgery. Medical dermabrasion “refinishes” the skin’s top layers through a method of controlled surgical scraping. The treatments can improve skin surface irregularities, giving the skin a smoother appearance. They can also be used to improve acne, traumatic, and surgical scarring. Dr. Vartanian uses both fine diamond and wire-brush dermabrasion techniques to resurface scarred skin. Dermabrasion is not the same as micro-dermabrasion, which is typically performed by aestheticians. Broadly speaking, there are two kinds of dermabrasion: cosmetic and medical. Both approaches are designed to improve skin tone and texture without surgery. Medical dermabrasion can help to reduce the appearance of scars formed as a result of an injury, previous surgery, or another concern. In some cases, this technique can also address keratosis, a type of scaly pre-cancerous growth. Dermabrasion can be used on both small and large regions of the skin, including the entire face, to achieve optimal results. Additionally, this versatile procedure can be performed alone or as part of a more comprehensive treatment plan for scar revision or removal. If you’re undergoing a surgical procedure, dermabrasion may be recommended about six weeks post-operatively to help minimize scar formation. However, even established scars can benefit from this technique, and patients interested in dermabrasion can schedule a consultation at their convenience. Medical dermabrasion is usually performed under local anesthesia in the office setting. The skin will be numbed and the procedure performed by Dr. Vartanian. Pain medication and relaxing medication are also used in conjunction with soothing music to provide a better experience for the patient. The downtime can vary from several days to a week depending on the depth of treatment. Patients can expect pinkness and some skin discoloration for several weeks to several months, which can be covered by make-up if needed. Subcision is a process used to treat scars left behind by acne, trauma, or previous surgery. It is also used to lessen the appearance of aging lines, such as nasolabial lines and glabellar lines between the brows. Subcision involves carefully separating the superficial skin tissue in the affected area from the deeper scar tissue with a fine needle or wire. This allows the anchor of the scar to be released, small amounts of the blood to pool under the affected area, new collagen to form, and can eventually improve the surface look of the scar or line. Dr. Vartanian combines this subcision technique with his dermal filler injections whereby he “releases” the scar prior to filling it. This combination yields great results and can stimulate collagen formation and scar remodeling for a long-lasting result. With certain depressed scars, dermal grafts (skin taken from behind the ear) or fat taken from the body can be used to “fill” under the scar (or wrinkle). With dermal or skin grafts, Dr. Vartanian may also use a full thickness punch graft that contains all layers of the skin to completely fill in a depressed scar. In other cases, he may use the dermal graft containing only the deep layers of the skin to fill under the scarred skin. Fat grafting can be used for some broad facial scars in the same manner as it used for areas of fat loss or volume replacement. The Palomar 1540 laser treatment is great at improving scars in an easy, minimal downtime procedure. It works particularly well for acne scars with minimal downtime. Besides improving the appearance of scars, it can also improve skin texture, sun damage, skin pore size, and stretch marks. Using fractional non-ablative laser technology, Palomar’s Fractional 1540 laser allows a more comfortable treatment with a rapid recovery. The patient typically can return to normal activities immediately, with 1 to 3 days of minimal redness and swelling. Fractional non-ablative skin resurfacing uses hundreds of tiny high-precision microbeams to create narrow, deep columns of tissue coagulation into the medium layers of the skin. During the natural healing process, new collagen is formed, thus improving scars, stretch marks, skin texture, wrinkles, and sun damaged skin. How Does Starlux 1540 Laser Treatment Work? The Starlux 1540 erbium laser beams actually go deep into the dermis (the deeper part of the skin) and promote the growth of new collagen in the dermis. This new collagen fills the deficient dermis, tightens skin, and plumps the skin beneath the depression. The best thing is that the Starlux 1540 is a non-ablative laser, which means that the surface of the skin is not damaged or removed during the treatment. This means that you do not have to go through the longer healing required by ablative resurfacing methods. What Is The Starlux 1540 Treatment Like? We apply a numbing cream to your skin prior to treatment for your comfort. The Starlux 1540 handpiece has a small circle at the end which is pressed against the skin, and the laser is then turned on. You will feel heat as the machine is turned on; however patients find it easy to tolerate. The skin is not broken, thus the skin is only pink or red after treatment. No open wounds, no skin peel, no need for soaks or dressings. The pinkness may last one to several days, but you can use makeup to cover it because the skin is intact. Some patients get noticeable results with one to two treatments. For most patients, about 4 treatments spaced 4-5 weeks apart are recommended to achieve maximum collagen production and skin improvement. Severe, deep wounds caused by acne or surgery may require more treatments for optimal results. You will see mild swelling the first two weeks after treatment, but this swelling is just the immediate effect of the treatment. New collagen production does not begin for six weeks after the treatment, and visible improvements are usually seen in several months. The collagen production continues for six months to a year after the last treatment. By 6 months into the program, which is 3 months after your last and fourth treatment, you should be seeing visible results. The results should continue to improve for at least 6 months after your last treatment. The Fraxel® Re:pair is another laser modality that can be used to improve acne scars while also tightening skin and improving fine lines and wrinkles. The Fraxel® Re:pair is a CO2 laser targeting the water content in skin cells of the skin surface. This allows the laser to treat multiple skin issues at the same time, including scars and acne scars. In addition, it allows us to accomplish our treatment goals in only a single treatment session. The Fraxel® Re:pair laser utilizes Fractional Resurfacing Technology where the laser delivers a series of closely-spaced microscopic laser treatment spots to the skin, while preserving normal healthy skin between the laser spots. This preservation of normal untreated skin between the laser spots helps in faster healing and optimal safety after the treatment. Since the Fraxel® Re:pair is an ablative treatment, skin surface will need several days to heal, and there will be greater downtime than the Palomar 1540 laser. Hence, the Fraxel® Re:pair has a longer downtime than the Palomar 1540, but the Fraxel® Re:pair can treat multiple skin problems in a single treatment. Dr. Vartanian can help patients decide which laser treatment will best help their scars. How Does Fraxel® Re:pair Treatment Work? As an ablative procedure, the Fraxel® Re:pair treatment uses a carbon dioxide (CO2) laser to vaporize microscopic columns of tissue deep within the skin. Fraxel® Re:pair treatment is a powerful procedure designed to treat the more advanced signs of skin damage in addition to scarring. Results are achieved in a single treatment and wound care recovery time is usually 24-72 hours. The results of Fraxel® Re:pair treatment are both immediate and progressive. Soon after the treatment, the surface of your skin should display less scarring, will feel softer, look brighter, and show more even tone. The next 3-6 months, as new collagen is made by the body, it should bring more improvements as the deeper layers of the skin continue to heal, including improvement of scars, loose skin, fine lines, and general improvement in the look of the skin. How Is Fraxel® Re:pair Treatment Performed? The Fraxel® Re:pair is an in-office procedure. First, your skin will be cleansed. Then, 60 to 90 minutes prior to treatment, a topical numbing cream will be applied to the treatment area. For additional comfort, we may also numb the skin with anesthetic facial injections and give you relaxing and pain medication. The procedure takes approximately 30 minutes for the full face. Patients typically feel comfortable and pain-free after a Fraxel® Re:pair treatment. The majority of patients report no need for pain medications after the treatment. 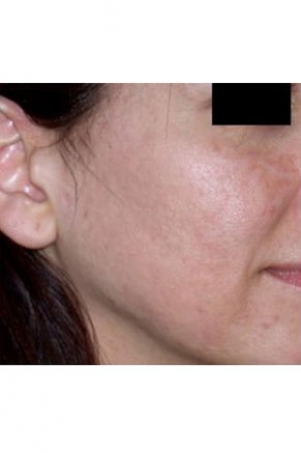 Treatment with the Fraxel® Re:pair typically results in visible improvement of scars and acnes scars in addition to skin tightening and significant improvement in wrinkles and pigmentation in the treated areas. The skin heals with an improved texture. The result is often smoother, tighter, and younger looking skin. For a majority of patients, only a single treatment is needed. For more information, please refer to the Fraxel® Re:pair section. In summary, we have many options for improving scars and acne scars. During your in-person consultation, Dr. Vartanian will be able to share which treatment can yield the best results for you. For more information on scar revision treatments, or to schedule a consultation with Dr. Vartanian to talk more about your options, please contact our practice today.